Moms and dads looking for quick and easy recipes for fast meals have lots of options. And quick meals don’t have to be bland and boring, either. If you use tasty, hearty ingredients, along with a little creativity, you can make numerous quick and easy meals that your family will enjoy by employing some cooking shortcuts. I love to cook homemade meals, and now that I’m retired, I have the time to do so. This wasn’t always the case, however. 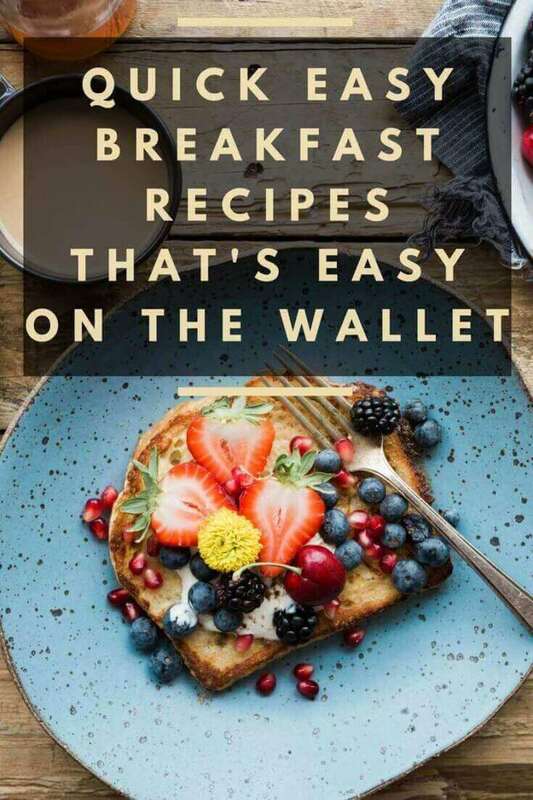 I was once a busy working mom who was always searching for easy dinner recipes and quick and easy breakfast recipes. The thing is, my family loves good food, so I couldn’t very well just open a can and heat up the ingredients – not without some “doctoring,” as my husband calls it. And even though I’m retired now, I occasionally turn to some of these easy recipes – not because they’re easy, but because some of them are so darned good! This is especially true of my recipes for chicken and dressing, crab stew, and chicken divan. 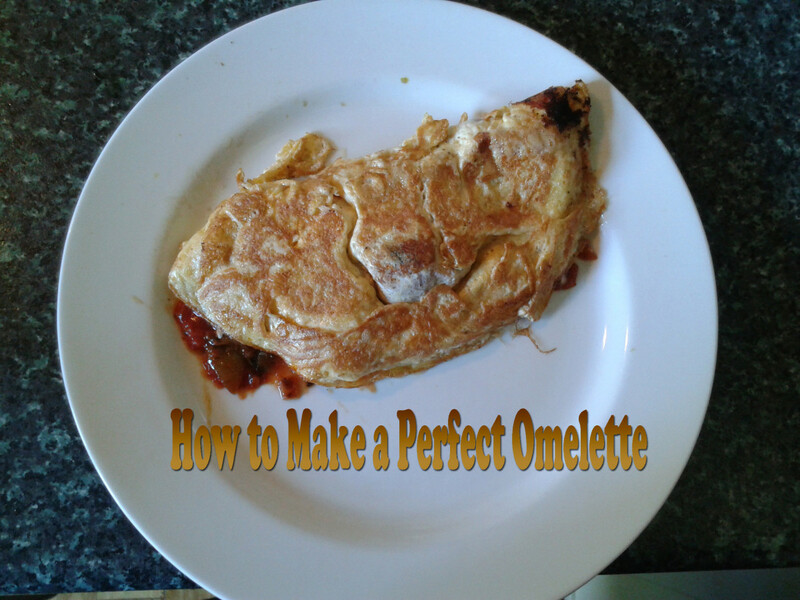 Hopefully, my quick and easy recipes will give you some ideas. For quick and easy recipes, you’ll need to keep some ingredients on hand that lend themselves to quick meals. A big part of the easy recipes equation is planning ahead and being prepared. Having to make an extra trip to the store sort of defeats the purpose of quick meals, so avoid unnecessary trips whenever possible. When my kids were little and I was working, I often turned to easy dinner recipes. I was a teacher, and I often brought home lots of work, and with three young children, I didn’t always have time to make big meals from scratch. And at the time, we couldn’t always afford to go out to eat or to get takeout. Sometimes it was just easier to make quick recipes in my own kitchen, anyway. 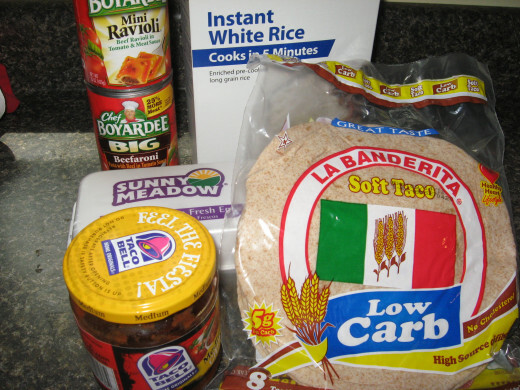 Below are some of my quick and easy dinner recipes that I used frequently. 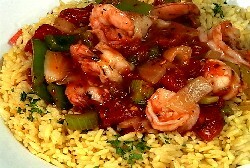 Shrimp Creole –For the base, use spaghetti sauce. Heat the sauce on the stove and add minced garlic, basil, oregano, a bay leaf, and a can of diced tomatoes (drained). Thaw the shrimp. Heat some of the frozen diced onion, bell pepper, and celery in the microwave, with a little butter, until the veggies are soft. Add the shrimp and the veggies to the sauce and heat to desired thickness. Serve over instant rice. Stuffed Portobellos - These are super easy and amazingly awesome! Rinse the mushrooms and scrape out the gills. Brush the insides and outsides with melted butter or olive oil. I like to stuff mine with crab meat, combined with mayonnaise, garlic, salt, black pepper, and cayenne. 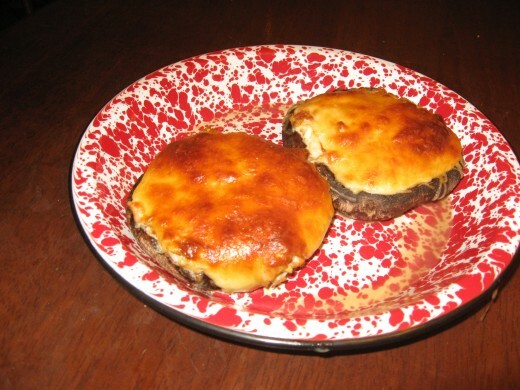 Top each stuffed mushroom with a slice of cheese - Havarti, Swiss, provolone, or other. Bake at 375 degrees until mushrooms are tender and cheese is melted. 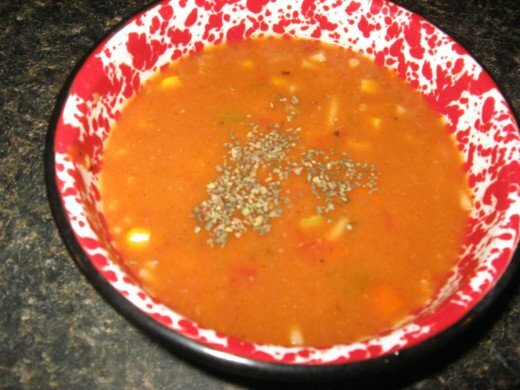 Vegetable-Beef Soup –Meal Starters is what makes this so fast and easy. Believe me – they have the same flavor and texture of cooked ground beef. Even my carnivorous hubby can’t tell the difference when I opt to use the soy crumbles in quick and easy dinner recipes. Start by heating spaghetti sauce or tomato sauce. Add a can of cream of mushroom soup, canned diced tomatoes, a can of mixed veggies, some frozen onion, and the soy crumbles. Season with your favorite herbs and spices. Chicken Noodle Soup –Who doesn’t enjoy a steaming bowl of chicken noodle soup on a chilly night? Of course, the problem with canned soups is that they’re skimpy on the meat. Add a can of chicken to remedy this problem. To improve the flavor, add some herbs and spices. For thicker, heartier soups, add a can of cream of chicken soup, cream of celery soup, golden mushroom soup, or some heavy cream. 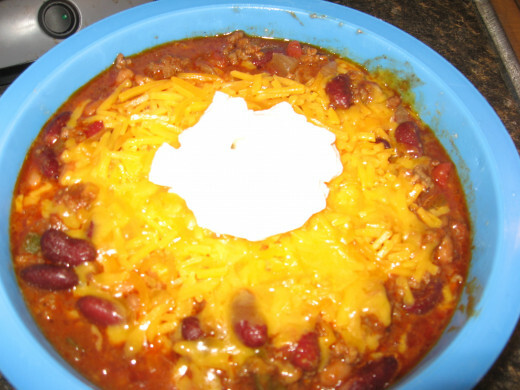 Chili –Combine tomato sauce, diced tomatoes, diced onion, and soy crumbles. Add drained kidney beans or chili beans. Season with salt, black pepper, cumin, minced garlic, and chili powder. Heat until mixture is hot. Serve with grated cheese and sour cream on top. Crab Stew –The base for this easy crab stew is canned potato soup. To the soup, add milk and butter and heat until smooth. Add diced onion, celery, and bell pepper, along with minced garlic. Stir in the crab meat and season with salt, black pepper, cayenne, and/or saffron. When the stew is piping hot, it’s ready to eat. Pasta -You can make lots of quick and easy meals with canned pasta – ravioli, beefaroni, lasagna, etc. place two cans of pasta in a microwave-safe dish. Add a little spaghetti sauce, some frozen diced onion, minced garlic, basil, oregano, and just a tad of sugar. Cover the top with grated or shredded mozzarella. Heat until pasta is hot and cheese is melted. Burritos –Heat Meal Starters in the microwave until hot. Drain away any liquid. Combine with taco seasoning and reheat. Spoon mixture onto tortillas and top with grated cheese. Serve with sour cream and salsa. 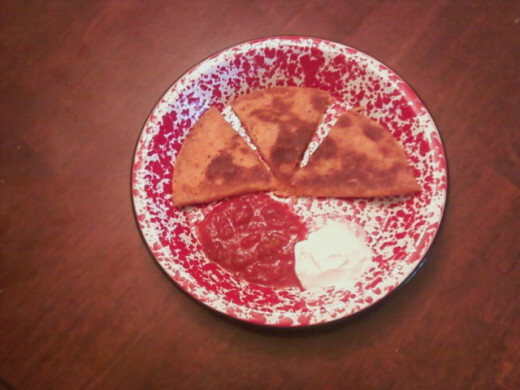 Quesadillas –You can make all sorts of quick and easy recipes for quesadillas – cheese quesadillas, “beef” quesadillas, chicken quesadillas, and shrimp quesadillas. 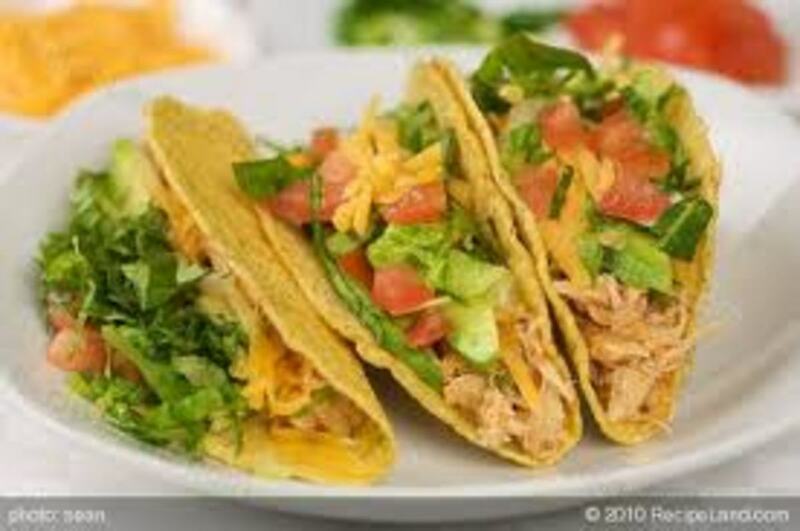 On a tortilla, cover half the circle with meat, salsa, seasonings, and grated cheese. Fold the tortilla over. Grease a skillet and heat over medium. When pan is hot, place quesadilla in and brown on both sides. Slice each half-circle into thirds and serve with sour cream and salsa. French bread pizza - Slightly thaw bread and split loaf in half, lengthwise. Combine spaghetti sauce with minced garlic, your favorite Italian seasonings, and a teaspoon of sugar. Spread sauce on bread. Sprinkle on grated mozzarella. Top with pepperoni, soy crumbles, bacon, sliced olives, canned mushrooms, and/or thawed frozen veggies. Bake at 400-450 degrees until cheese is melted. 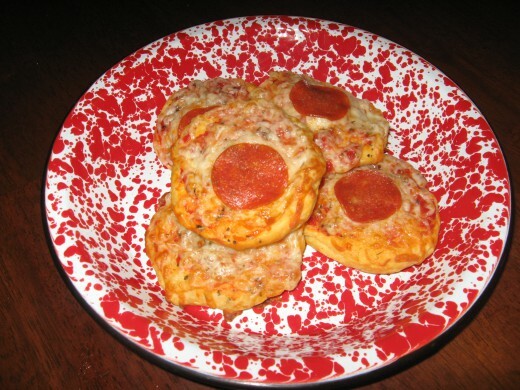 To make a version of easy pizzas that kids will love, use flattened refrigerated biscuits for the crust. Chicken and Dressing – This is a delicious recipe, and it’s super easy! It actually tastes like old-fashioned cornbread dressing. In a large bowl, microwave frozen diced onion until soft. Add a box of cornbread stuffing mix, one can of chicken broth, two tablespoons melted butter, an egg, a large can of chicken (with liquid), and your favorite seasonings. I like to use a little poultry seasoning. Turn mixture into a buttered casserole dish and bake at 350 degrees until desired firmness. Chicken Divan – This is a wonderful recipe, and you can make it any size you need. 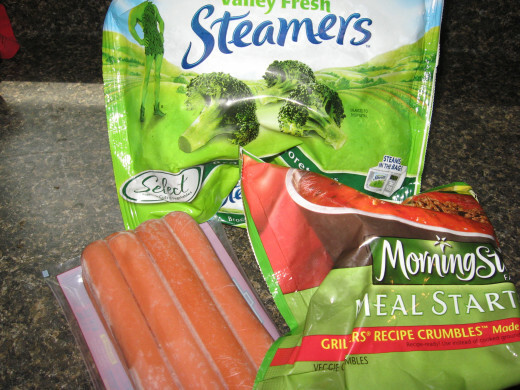 Microwave a bag of steam-in-the-bag broccoli. 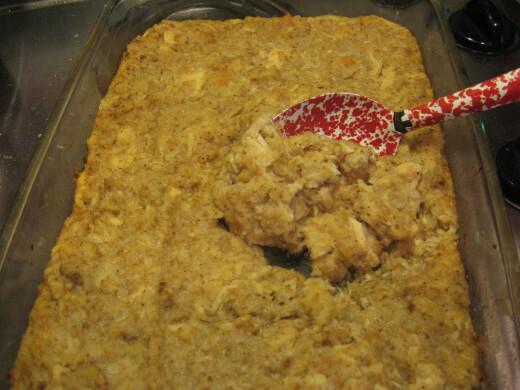 In a baking dish, spread a can of drained chicken over the bottom. Top with drained broccoli. Combine one can cream of chicken soup, one cup mayonnaise, and one cup grated cheddar. Spoon mixture over the top of the chicken and broccoli and spread evenly. Top with crushed buttery crackers. Bake at 350 degrees for 30 minutes. Serve with instant rice. Red Beans, Rice, and Sausage - For this dish, you'll need instant rice, fully cooked smoked sausage links, canned kidney beans, and frozen onion, bell pepper, and celery. Cook the veggies in the microwave with butter. Slice the sausage links and heat in the microwave. 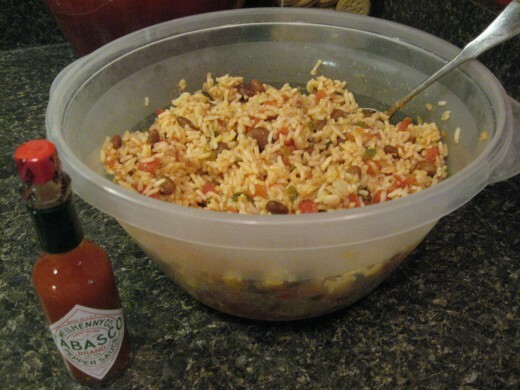 Cook the rice in the microwave with a can of diced tomatoes, with liquid. Combine everything together and add drained beans. Season with hot sauce, salt, minced garlic, cayenne, and basil. 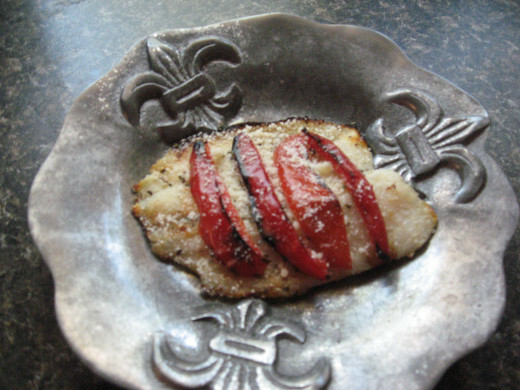 Indoor grilled fish – I like to keep frozen fish fillets on hand at all times, and I like the ones that are individually wrapped. They thaw in no time, and they cook quickly on a George Foreman grill. I’ve found that thinner fillets work best, and since I like mild-flavored fish, I usually choose tilapia, flounder, sea trout, or cod. I first spray both grilling surfaces generously with butter-flavored cooking spray and season my fillets with lemon pepper, paprika, and cayenne. Sometimes I grill some bell pepper strips along with the fillets. When the fish is done, I drench it in lime juice. Serve your grilled fish with instant rice or microwaved potatoes and microwave-steamed broccoli or asparagus for quick meals that are tasty and nutritious. If your mornings are hectic, quick and easy breakfast recipes can be real lifesavers. Of course, you could always send the kids out after cold cereal, but a hot breakfast is just so much better! It takes just a couple of minutes to cook eggs in the microwave. I spray a glass bowl with cooking spray and add beaten eggs and a little water. I zap the eggs for one minute, then I remove the eggs and give them a quick stir. I continue this process until the eggs reach the consistency we like. 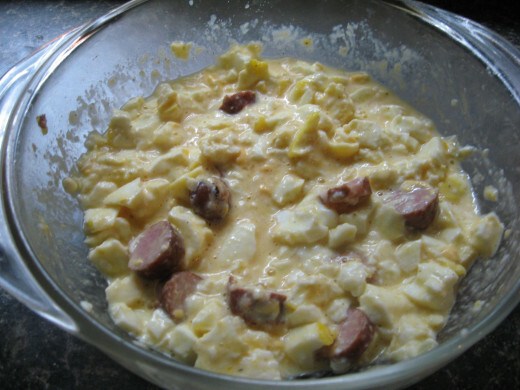 For heartier microwaved eggs, I add grated cheese, bacon bits, and/or crumbled sausage. 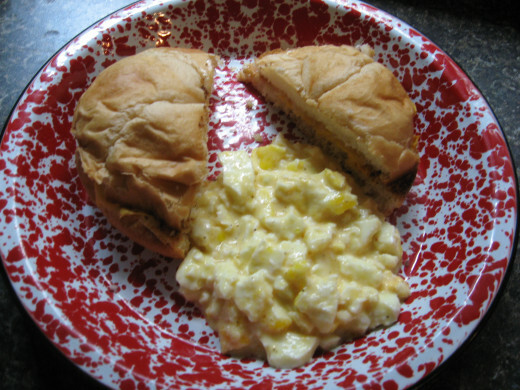 Other quick and easy breakfast recipes I use are for sandwiches. I like the large pre-cooked sausage patties from Walmart because they cook quickly in the microwave. They’re great on toast or English muffins, with melted cheese. And speaking of cheese, grilled cheese sandwiches with bacon bits also make tasty breakfast dishes. My grandkids love frozen waffles, especially when I dress them up a bit. I don’t usually cook the frozen waffles in the toaster because they often get too hard and crunch. Instead, I cook them in the oven on a cookie sheet. When they’re done, I cover them with a dishcloth for a few minutes, and the trapped steam makes the waffles softer and fluffier. Sometimes I top the waffles with powdered sugar, canned pie filling, fruit syrup, or fresh fruit. Serve your waffles with microwaved sausage patties. You probably have your own quick and easy recipes stash. 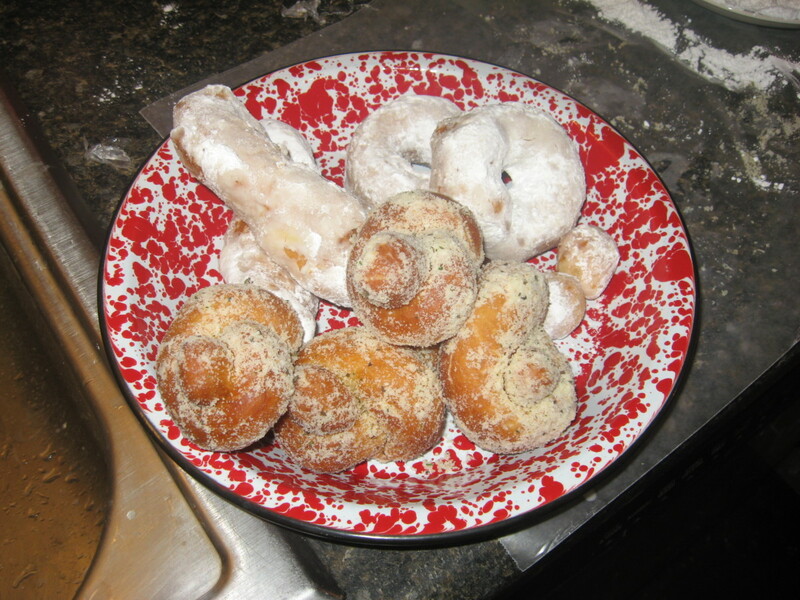 In fact, you might already use easy recipes that are similar to the ones I’ve presented here. If that’s the case, I’m sorry I wasted your time. I think, though, that the information presented here will be beneficial to beginning cooks who might not have discovered very many cooking shortcuts yet. I’m always amazed at some of my friends who never think of tweaking canned or frozen foods – and most of these women have been cooking for years, so they’re not novices in the kitchen. I’m not sure if this is due to a lack of imagination or if it’s because they just don’t want to go to any extra trouble. When you really think about it, however, it really doesn’t take much work to turn prepared foods into quick and easy recipes that are much more palatable. A very handy collection of recipes to make life easier without completely copping out of the cooking. Thanks for sharing your shortcuts. The beauty of these recipes is the unusual combination of common ingredients. Shrimp creole using spaghetti sauce and a few spices? Brilliant! Voted up and useful. 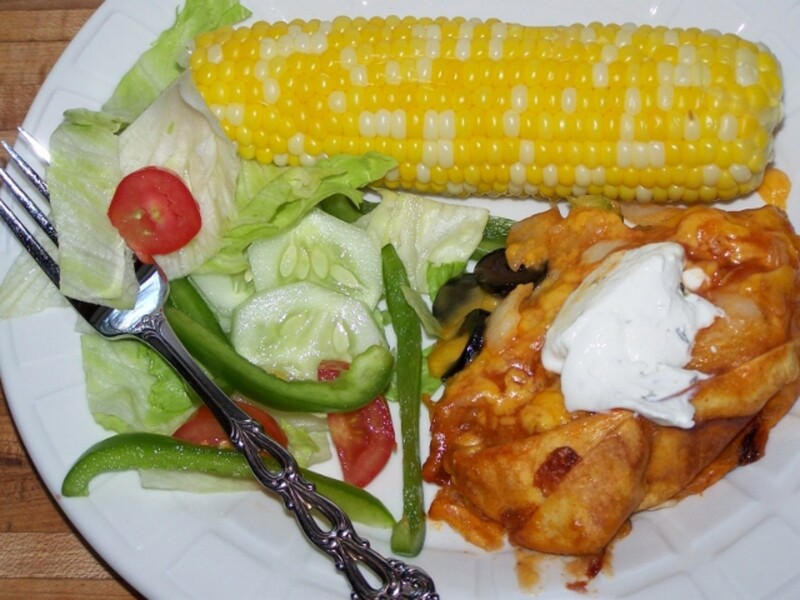 Great quick and easy meals, Holle. Thanks for your suggestions. The first one I plan to try is the Chicken and Dressing. Looks yummy. This is a wonderful collection of ideas for quick and easy meals. I'm always looking for ways to put a meal together quickly. I remember when French Bread Pizza was a weekly thing around my house. And, Campbell's Cream of Mushroom Soup was one of my biggest helpers in the kitchen. Great hub. Thank you for sharing it. Am I invited for dinner. All of this looks delish and seemingly fairly easy. You did a good job in assembling all these great ideas and deserves a vote up. Thanks for taking the time time share all this great information. Gosh. This is like a whole cookbook Habee. Great hub. Wow, Holle! These are AWESOME ideas! Everything looks and sounds delicious! I'm definitely keeping this one in my favorites. Voted up and Awesome, and shared it on Pinterest! I want to eat at your house! Could I just drop by daily for a meal? I won't stay long and I'll wash the dishes after....please!!!!!! Great hub; I'm all for easy, quick meals, and this is a plethora of great ideas.